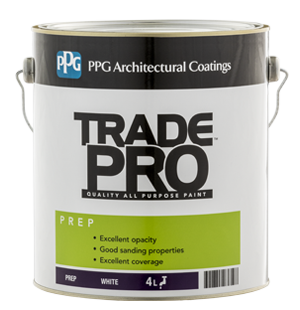 The PPG Trade Pro range is an interior water based paint designed specifically for the trade painter. Extending across 3 categories; Prep, Walls & Ceiling; they are easy to apply and provide good coverage for all your interior painting needs. Check colour before use. Box individual cans before use. Preparation Products – Apply one coat by brush, roller or spray. Finishing Products – Apply two even coats by brush, roller or spray. Up to 16m² per litre. Coverage will be lower on rough or absorbent surfaces. Ensure adequate ventilation. Keep floors and furniture covered. Keep the lid on containers when not in use.